Sorry, there are no products matching this search. Discover a wide selection of Watches at Banks Lyon Jewellers, alongisde a stunning rage of Jewellery and engagement rings. Available with an option of 0% finance on purchases of new products above the value of £500. If you are interested in the price or availability of any item, either on our site or by the brands we carry, please don't hesitate to contact us via personalshopper@bankslyon.co.uk or by calling 01524 381020. The word ‘garnet’ does not actually denote one particular stone, but rather a whole group of silicate minerals that have been highly popular as gemstones for time out of mind. Whilst garnets do all exhibit many similar forms and properties, few stones manifest themselves in more diverse colours, and as such garnet gemstone rings are a superb investment for those seeking a really individual ring. Garnets are also the traditional birthstone that has been matched with January births, so despite them being a relatively ‘obscure’ gemstone compared with many, they are still very popular to use within many jewellery pieces. In terms of predominant hues, garnets can be found in reds, oranges, yellows, greens, purples, browns, blues, blacks, pinks and even virtually colourless forms, and therefore it almost seems a shame to encompass such myriad beauty under a single ‘umbrella’ term. The blue garnet is typically venerated as the most valuable deviation, but regardless of their colour all garnet gemstone rings are thoroughly striking and stand as superb statement pieces no matter when they are worn. Whether they are eternity rings or dress rings, you could find few stones that are better suited to their task. 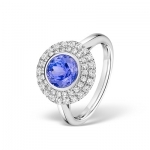 As a firm that frequently partakes in the design and creation of bespoke jewellery, we believe it is especially important to offer an assortment of delectable gemstone rings to cater to any conceivable preference. As such, garnet gemstone rings are an integral part of the Banks Lyon stock, and we’re always happy to hear from you if you have any specific requests as well. No enquiry is too precise, and our friendly and experienced team are always available to contact by calling 01524 38 48 58 or emailing Personalshopper@bankslyon.co.uk. We’ll only be too pleased to guide you towards the ring of your dreams.